Black Performance Theory Conference, May 2011. The Hemispheric South/s Research Initiative is very pleased to host the 2011 meeting of the Black Performance Theory working group, “BPT 2011 :: Hemispheres & Souths” happening May 6-7, 2011 at the University of California, Santa Barbara. At each meeting, a small cadre of scholars and practitioners share work in experimental sessions that have included dance performances, play readings, poetry and solo performance work, film screenings, flash animation presentations, and the creation of group improvisations. A space for active Witnessing allows audience members to engage productively with Participants’ contributions. This year’s overarching theme draws inspiration from contemplations of black meetings and crossings in hemispheric and global souths. 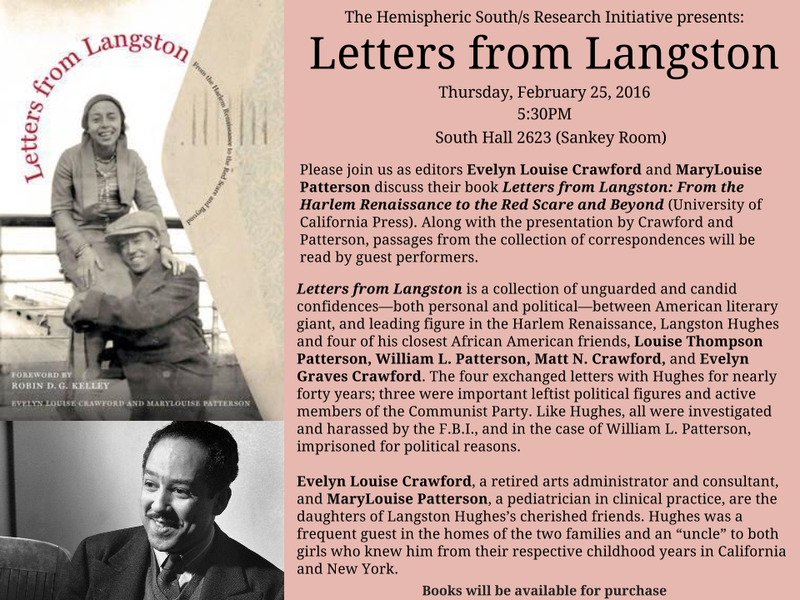 BPT:: “Hemispheres & Souths” invokes the vast and broad oceanic and land-based circulations of black performance. The 2011 working group seeks to link the translations, transmigrations, transnationalisms, and diasporisms implied by the notions of a Hemispheric South and a Global South to performance as practice and to nuances of race as performance. Participants’ work constitutes a provocation that suggests unexpected routes of diaspora across “Hemispheres” and “Souths.” Presentations can be partially literary, but contain an element of performance. In preparing an offering for the group this year, Participants take up the overarching concept of a cardinal point like “South” or “West,” “East” or “North” and work it through a combination of texts and/or scholarly works. For example, presenters might pick an imaginary place like the “dirty dirty South” and theorize it through Appurandi, Wyclef Jean, and Zora Neale Hurston to offer a hybrid performance of black social dance circa 1920 and 1990. Other imaginative structures might include “Up South,” “Down South,” “Southsides,” “Pacific Rims,” “Atlantic Rims,” “Black Cities,” “Black Wests,” “I(s)-lands, ”“Promised Lands”… etc . to theorize Black “Hemispheres & Souths” in performance. Participants work in teams to construct creative presentation formats beyond the traditional conference-style reading of prepared papers. In this way BPT:: “Hemispheres & Souths” facilitates live, creative collaborative adventures in theory and performance. The Black Performance Theory working group is a collective of scholars working on the theory, history, and practice of African American expressive cultures. The experience of writing and performing theory links scholars and scholar/performers in unique modalities of conversation, debate, and collaboration. Diverse disciplinary perspectives provide an unbounded look at performative commonalities of African diaspora including, but not limited to, gospel music, concert dance, hip hop music, black church oratory, architecture and public space theory, theater historiography, and queer cultures. 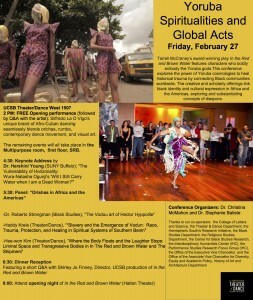 We strive for vibrant critical discussion of methodologies, paradigms, and approaches to theorizing black performance. “Black Performance Theory,” E. Patrick Johnson, Northwestern University, 2007; •”Afrosonics: Grammars of Black Sound,” Daphne Brooks and DeFrantz, co-sponsored by the Afro-American Cultural Center, African American Studies and the World Performance Project, Yale University, 2009. I love the organic, critical, rich, and dynamic energy of Black Performance Institute: Hemispheres and Souths! It is a blessing. Not only master minds, but folks putting bodies into motion and performing for the GODS! Wow. I had a great time at BPT this year. The field is in such good hands with such wonderful folks coming up and through. Dear Stephanie, I want to thank you for an incredible weekend. Not only was I intellectually edified, I also very much so felt affirmed. I look forward to attending future BPTs. Thank you for organizing a great BPT! I had fun. Thank you for your time and energy. Both are greatly appreciated. Thank you so much for welcoming me into the group and for facilitating and nurturing this wonderful space. I am deeply grateful for your generosity and for all of the good learning. That was a really fun, inspiring and productive BPT. Thank you for all your planning and fundraising. We really appreciate it and you! And, I look forward to the opportunities that come out of this meeting as well as our future BPT endeavors. Stephanie, Thank you much for all of your hard work and making us feel welcome at BPT/UCSB! I am very inspired and excited to meet so many scholar/artists working in this field. I look forward to keeping in touch. Since 2000, each event has received funding and administrative support from SLIPPAGE: Performance|Culture|Technology, the research group founded by Thomas DeFrantz at MIT. The group functions as a site for intellectual creativity, for communal consideration of foundational concepts in performance theory, and as a much-needed opening into the space of performance discourse as it might be inflected black.